Looking at the personalities behind London's small businesses. Avid cyclists and friends, Piotr Kielbasa and Jerzy Kuzminski founded London Bicycle Workshop to provide London's cyclists with expert bike care, repair, rebuild and bike customisation. How did London Bicycle Workshop come about? Piotr was inspired while working at a popular bike shop. During Christmas 2008, he had to turn away ten repair requests in one day because the shop's mechanics were too busy building bicycles for sale. Around the same time, during his commute to work, he noticed the empty storefront, located on one of London's popular bicycle commute routes and near some of the best bicycle shops in town. Piotr knew he wanted a partner and approached Jerzy, who was an assistant buyer for the shop and holds an economics degree. After a seemingly endless process of chasing the lease agreement and a re-fit, their shop opened for trade in September 2009. "It has always been the plan to have a bike shop," says Piotr. "I started the business plan," he continues "and I rewrote it!" retorts Jerzy. They pooled their funds and approached a bank for funding. "The financial crisis helped!" says Jerzy, speaking of a government scheme providing banks with repayment guarantees in exchange for increased lending to small businesses. As for the shop itself, their philosophy is transparency. "The idea is for people to see how bikes are fixed," says Jerzy. They designed the space so customers can see the work happening on the shop floor and can marvel at the tools neatly arranged on a wall. "It's like an open plan kitchen!" jokes Piotr, adding "we have all the necessary bits so we don't refuse customers." In addition to repairs, Jerzy and Piotr focus on reinvesting as much as possible into the shop to expand their range of products. How many people work for London Bicycle Workshop? 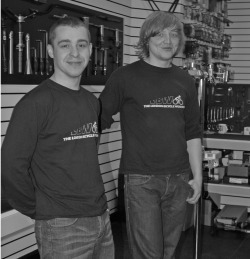 Piotr and Jerzy each work more than 50 hours a week and hope to hire two mechanics. What is the best thing about being part of London Bicycle Workshop? "Being able to do it the way we want," says Jerzy. "We have similar ideas of how we wanted the place to look and no one tells us we can't." "Choosing the products," says Piotr, "[we sell] what we want; what we believe is good." Securing the property was the most difficult and stressful part of the process. Everything after that, they can handle! "You definitely need to be positive. You need to look forward to good things," says Piotr, and "don't hesitate. Just plan it and do it," says Jerzy. "There's always a way of getting the money if you've got an idea." London Bicycle Workshop is located at 170 Clerkenwell Road, EC1R 5DD London, 020 7998 8738.